Trials are held for players in 9th Grade and above for players interested in playing in the top two teams to enter each grade’s Premier Leagues. It’s ok not to trial, and these players will be put into teams with those that are not selected via the trial process based on where they live, schools they attend, any specific requests, or volunteer coaches etc. These teams will play in the Hutt Valley league which is more social than the Premier League. Trials ensure players are placed in teams suitable to their level of ability and commitment. We are making improvements this year with a consistent process and approach on the day led by all grade managers alongside our junior director of coaching Pedro Garcias. We’ll add more detail to this page as it is agreed and published. These are open to everyone and not compulsory. Pedro Garcias, junior director of coaching will give players training sessions, provide guidance and explain the trials process for the kids. Find your grade’s pre-season training dates and times. Players must be registered with us as a club by Sunday 24 February to be able to take part in trials. Goalkeeper trials ! CANCELLED ! UPDATE: After agreement from all grade managers we have cancelled these trials and we will have seen our players during each grade’s respective trials. Anyone who indicates this as their preferred position during trials will be assessed as a goalkeeper during trials. These extra trials will be run if interest outweighs positions available in the premier teams. This will be confirmed by your grade manager. RSVP: let your grade manager know that you intend to trial so we can set up in advance. Our goal is to have consistency across the grades and conduct the grading process in an equitable and fair manner. Take advantage of the pre-season training. This is aimed at getting players ready for the trials. Skills and drills in the trials will be the same as you’ll get in the pre-season training. RSVP to your grade manager that you’re coming and nominate your player’s two preferred playing positions. Independent assessors (not coaches from the trialing grade) will meet with grade managers to confirm the grading format. Arrive early and you’ll be given a coloured numbered bib. Players will be rotated around drills/skills stations (around 10 minutes each) with a dedicated assessor on each station for consistent marking. Players will be play in small-sided games. This format is dependent on how many players participate in the trials. Parents and spectators are not allowed on the turf and we encourage parents to let the kids be themselves and not order them around the pitch. Players will be assessed during the trials and independent volunteers will make notes and meet with the Grade Manager after each trial to discuss player attributes as required. We’ll conduct at least two trial sessions, which are progressive with selectors mixing players to get a good look at all attending. Small-sided and age-group appropriate sided games will be played for a maximum of 15-minutes duration. We’ll aim to give all players equal game time and opportunity to rest and take on fluids. After the second session the Premiere League squad will be selected. Thereafter the other teams in the grade will be named. Selectors will also take into account previous knowledge and past performance of returning players. Parents / caregivers will be contacted by their grade manager informing them of the team their player is selected for. The grade manager, the top two team coaches and the director of football will decide from the squad of Premier League players the final make-up of the teams for the start of the season. The grade manager is the final arbiter of any selection disputes. Check back here soon to download a copy of the assessors checksheet. 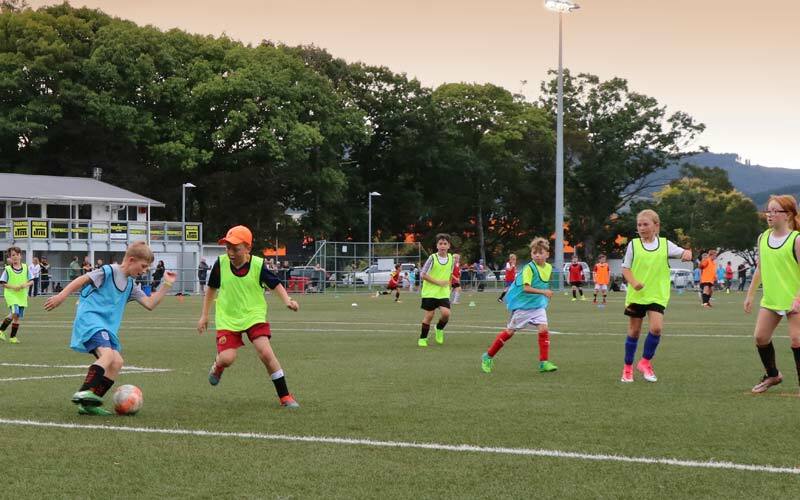 New Zealand Football best practice recommendations have been incorporated into the trial process to assess technical competency and enable selectors to gauge player ability. Specific age-groups will place emphasis on some areas more than others.